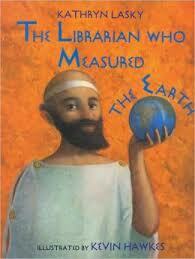 A historically accurate children’s book about Eratosthenes, a Greek librarian, and mathematician at heart, who figures out how to measure the earth using only a shadow, and some geometry. I love that this could be read to young children, or high school age kids, and all of them could learn something new from it. It is a great literature resource for math, which is hard to come by! While it is a young children’s book (recommended for grades 2-5), I was able to use it in my 8th grade geometry class to introduce arc lengths, and central angle measurements (and put them into action). Thanks, Ana, for this recommendation. I agree, it’s really hard to find great children’s books about math. I look forward to reading this myself. A great recommendation for teachers, home schooling parents, and others interested in making math fun and accessible.